The What: RDL has begun shipping five new wall-mounted Dante audio network interface products. These bidirectional products interface microphone and line-level audio with a Dante network and are packaged in a dual-Decora form factor. Each product is available in white, stainless steel, or black. The What Else: The product line includes the DD-BN22, which converts two mic or line audio sources to Dante and two Dante network audio signals to mic or line level; DD-BN2M, which converts two mic or line audio sources to Dante and two Dante network audio signals to line level; DD-BN2ML, which converts a mic or line and a consumer line audio source to Dante and two Dante signals to line level; DD-BN31 which converts two mic or line and one stereo line source to Dante and four Dante signals to line level; and DD-BN40, which converts four mic or line audio sources to Dante and two Dante network audio signals to line level. 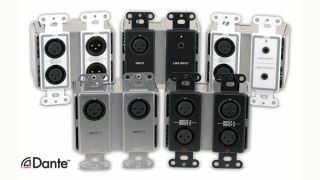 Unique features include stainless steel chassis, metal XLR jacks, heavy-duty mini jacks, superior heat dissipation, industry-standard digital and analog signal levels, low noise with full headroom, rear-panel outputs to feed compatible RDL jack plates, and recessed RJ45 with top cable entry for easy installation. The Bottom Line: The new interfaces meet the requirements of customers who need to run digital, networked audio, to and from a wall in a facility. As with all RDL Decora-style products, the front laminate text may be customized for easy identification of inputs and outputs.